Hemp Bombs has always had a customer-first mindset, which is the reason we go to such detail in product development and on our website. Our CBD Bundles are customer-friendly CBD care packages that take samples from our product line and offer them at a discount. Currently, Hemp Bombs offers three bundles - Sample, Edible, and Premium - to customers. Each of these bundles showcases a different section of our product line. Avoid the selection headache of a la carte products and try out a CBD bundle. 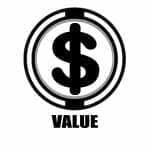 They are one of the most consumer-friendly options available on the market. The Sample Bundle is a great entryway into the Hemp Bombs product line. Try our 1oz CBD Pain Rub, 5-count Gummies, Capsules, and our most popular 75mg CBD E-Liquid, Exotic Watermelon Kush. Our “Edibles Bundle” is made for the edibles enthusiast, and individuals who do not smoke/vape. This is an entry-level sample of all Hemp Bombs edible products, including CBD Gummies, Capsules, Oil, and Syrup, priced modestly. 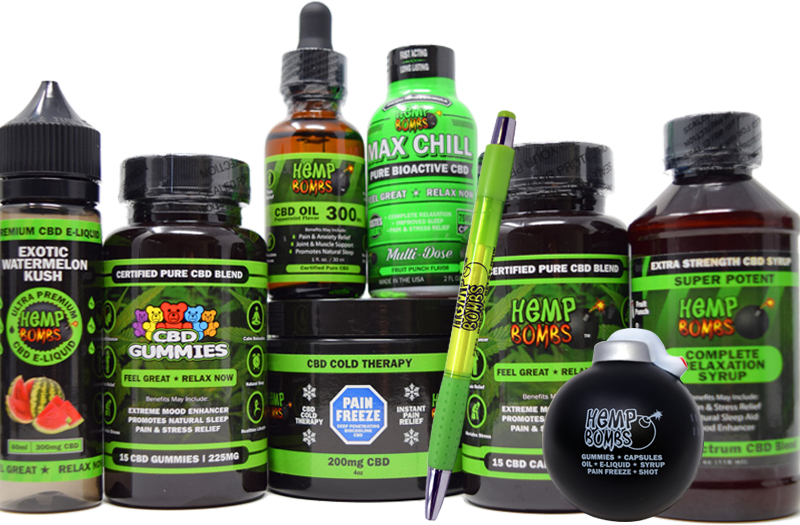 The Premium CBD Bundle is designed for the seasoned CBD user who wants a taste of the whole Hemp Bombs product line. 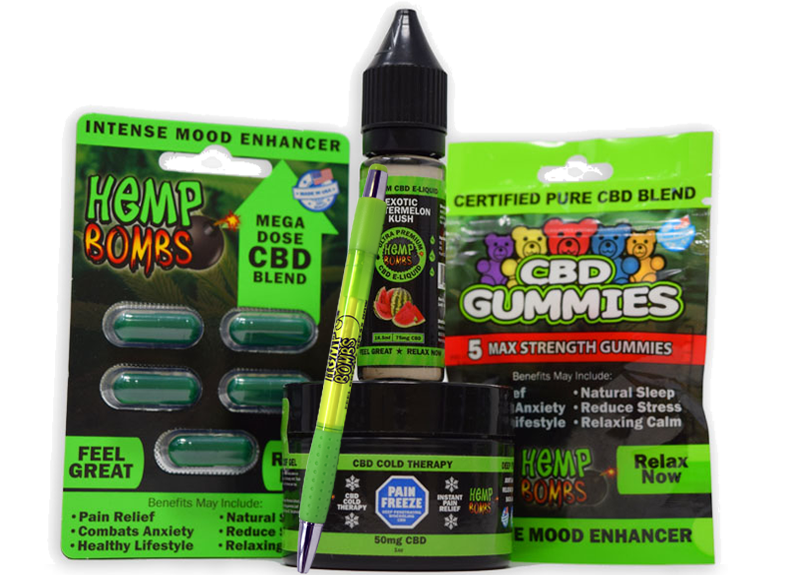 The Premium Bundle contains our CBD E-Liquid, Gummies, Capsules, Pain Rub, Oil, Max Chill Shot and Syrup to give you a picture of the total Hemp Bombs experience. Our “High Potency Bundle” is made for the CBD user that likes to get the highest concentration of CBD. This is a great way to sample the highest potency Hemp Bombs products, including CBD Gummies, Capsules, Oil, and Pain Freeze. Makes a great gift too! 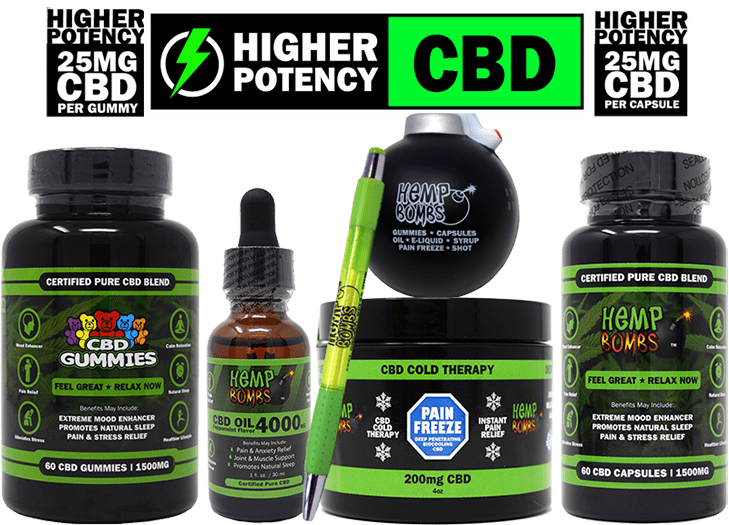 If you are new to CBD, Hemp Bombs CBD Bundles are a great introduction to what people are calling a “miracle compound.” Each Bundle is reasonably priced and contains an assortment of our premium CBD products. We want you to be able to experience the wide variety of therapeutic benefits CBD has to offer without breaking your bank. Hemp Bombs CBD Bundles don’t force you to choose between products that you are thinking about buying. Instead, our CBD Bundles cater to your preferences containing a variety of CBD vape, edible, and topical products. Complimented with a Hemp Bombs pen and stress ball, our CBD Bundles are made to give you options so that you can find which CBD product works best for you. 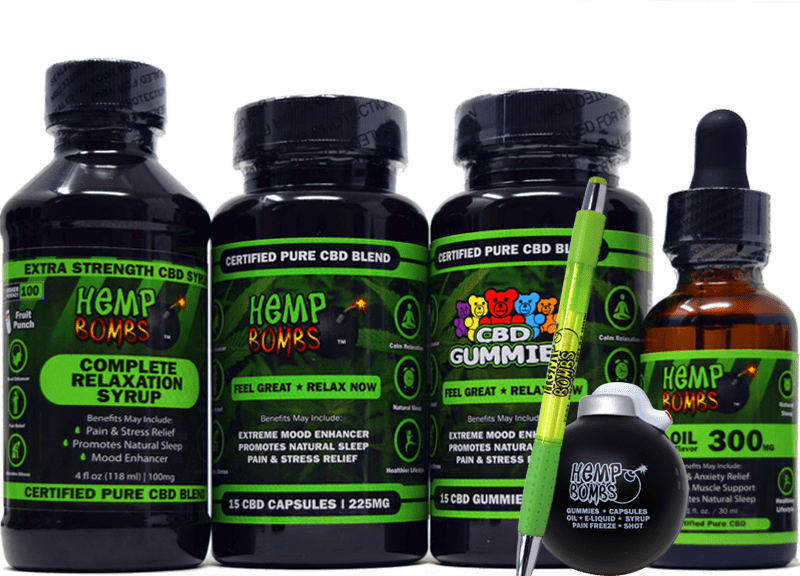 Why Should I Choose Hemp Bombs CBD Bundles? Hemp Bombs CBD Bundles don’t just stop at a value and variety. At Hemp Bombs, we pride ourselves on being a respected and reliable CBD brand. From the time we source our premium-grade Industrial Hemp to the time your product order reaches your door, we maintain the highest quality control over all processes. We are very selective in the Industrial Hemp we use, and that is why we choose highly qualified American farmers who only use sustainable methods. Hemp Bombs Hemp is grown in soil free of any harmful chemicals, pesticides, or heavy metals. We like to ensure you that you are receiving a product that is beneficial to your health. To extract our CBD, we use the CO2 Extraction Process, which is widely regarded as the purest, cleanest, and most environmentally friendly process currently known. The CO2 Extraction Process allows us to isolate our CBD, eliminating all traces of THC. 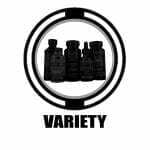 All of our products are also third-party lab tested to certify their purity and quality. Hemp Bombs CBD products will not promote a “high” or result in any psychoactive effects. Instead, they will encourage a boost in mood and overall feeling of relaxation. When formulating our CBD products, your health is our primary concern. Through all of our detailed processes, we can provide you with premium CBD products that you can use daily to benefit your overall health and wellness.